Rodney will dispute this version of events, but it’s the one I’m writing down and preserving as the truth. When we first met, he moved fast. After our second date, he started introducing me as his “serious girlfriend” and waiting for me to disagree (I didn’t). Five months in, he asked what I was doing for the holidays, and I mentioned I was traveling to Spain to meet up with friends. He said “Great, I’ve never been to Spain before,” and bought a ticket. I pumped the brakes, or tried to. “We barely know each other! What if we run out of things to talk about?” I said. “What if we get bored?” He ignored me, and in a thoughtful gesture, booked us a weekend at a posada in a no-stoplight Andalucian town. “What on earth are we supposed to do in the middle of nowhere,” I grumbled, “How many books can we possibly read? What if we get bored, for real? It seems kind of quiet there.” As I type this, I realize that he is a patient man, and I’m as romantic as a cinderblock. Part of my alarm was that as a good Indian girl, I didn’t want to tell my parents about this development. Unmarried men and women were not to travel alone together, and when was I going to get married anyway, what was wrong with Rahul from Chicago who I met once, why was I being so picky, and did I even care about preserving our dying language, at all? It would open up a can of worms I didn’t want to discuss. Adhering to our unspoken don’t-ask-don’t-tell-unless-you’re-getting-engaged policy, I said I was going to Spain to meet up with my friends Beatriz and Sarah (true), and left it at that. I didn’t feel great about my omission, but I was technically an adult in my late twenties, and this felt important. We learned we had a similar traveling style, meandering daylong city walks punctuated by five to seven meal stops. Roast chicken with our bare hands at El Pollo Rico, jamon carved off a leg on Beatriz’s coffee table, Paella followed by a three-hour nap. We didn’t do everything the same; Rodney can spend two hours staring at one painting in a museum, but I learned to wait in the café with a book after breezing through. His idea of vacation reading was a ten-pound Bolaño novel, while an unsatisfying archival dig reveals I read the entire Twilight series. Our posada was not the snoozefest I had feared. The chef had trained under Gordon Ramsay, and the food was otherworldly. Christmas Eve dinner was served in their cozy dining room with fire crackling, paper crowns and presents for the mostly foreign guests. For two people who don’t celebrate Christ, we leaned heavily into Christmas, and bonded with our tablemates, a jovial British family. Spain obviously holds fond memories for us. 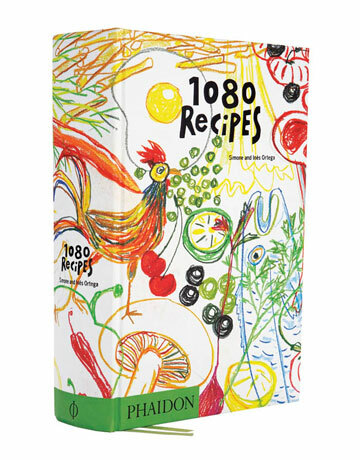 And I’ve wanted to dive into Simone and Inés Ortega’s 1080 Recipes in the seven years since our trip. The publisher, Phaidon, calls it Spain’s answer to The Joy of Cooking. Most of all, I was hoping to demystify “gazpacho,” which I’ve seen both as a thin salsa and a pink bready paste. After researching the writers, I felt confident they’d offer me clarity. Our guests were meant to be our friends Greg and Robin, but I felt a head cold coming on, so I warned them away. In the end, I’m glad it was just us, not just because “alone in Spain” was an adorable theme to recreate, but because the night would have ended with their deflated hostess ordering pizza. At least I learned how to peel a tomato with a knife (rub all over with dull side to loosen the bond, then pull back with sharp side). Beyond that, I should have run screaming from this recipe’s flawed ratio of five cups of water to two tablespoons of breadcrumbs. Thanks to its wackadoodle unit conversions, I ended up with a savory finger bowl. I salvaged it with some more vinegar and olive oil, but we still ate dressing for dinner. This is the kind of recipe I love working into the rotation, easy and versatile. Make some salmon any way you like, and drizzle with a balsamic vinaigrette containing fresh orange juice and zest. I made a jar of this dressing and used it on salads, fish, and vegetables for the rest of the week. Dessert: Considered a Sweet Walnut Loaf, and decided against it. Because of the book’s unreliable measurements, I was scared to make dessert. After a hop in the right direction with my last soufflé, I’m not sure I’ve built the emotional foundation yet for confectionary dejection. My suggestion would be that the translator of the book should be expelled out of Spain immediately and permanently, there is no mistakes, the translator has no shame, and he/she has no respect for Spanish heritage…So in the end as we say in Spain… If this is the Bible of Spanish cuisine take my hat thus I will have to eat it. It’s worth looking through everything else Miguel has recommended, because he seems like he knows what he’s talking about. I emailed Phaidon, who responded with concern, and a promise to investigate before reprinting. They checked against the original, and the units are the same in Spanish, so we’d have a bone to pick with Ms. Ortega, who took this mystery to her grave in 2008. In addition to an expression that is equal parts skeptical and charmed, you might notice that I’m wearing a yellow sapphire ring. My mother had slid it onto my forefinger while gravely warning me not to take it off, because it was going to find me a partner. It did, and conveniently, that partner loves the taste of pickle juice. Awesome! What a delightful and enchanting read – you’d never know it was composed by someone as romantic as a cinderblock.